Pros: Elegant music and moving poetry in an atmospheric music hall setting. Cons: It was frustrating that the images of the First World War projected onto the organ pipes were completely distorted. Beautiful and haunting, this performance is the perfect tribute to the poetry of the First World War. Saturday 28 June marked the 100th Anniversary of the assassination of Archduke Franz Ferdinand and his wife Sophie Duchess of Hohenberg in Sarajevo. The shot fired by Gavrilo Princip set in motion a chain of events that started the First World War. It seemed appropriate on this day to be attending the LIFT Festival (London International Festival of Theatre) at Battersea Arts Centre, which in fact featured a line up of thousands of dominos to show how the assassination led to the start of a world war. 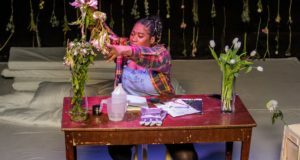 The festival was a three-day event, which combined immersive performances, interactive theatre and music. All of the pieces were a response to the First World War and the impact it continues to have today. 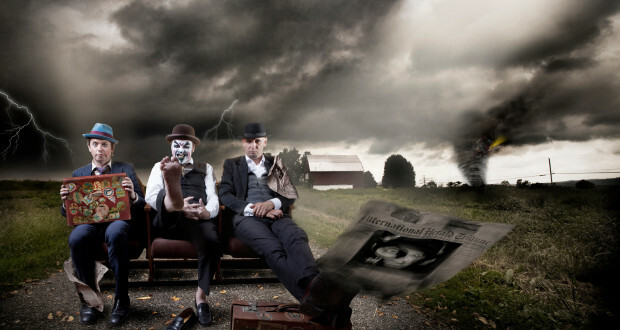 As part of the festival, The Tiger Lillies (post-punk cabaret artists) performed the world premiere of A Dream Turns Sour, a concert of songs they created using First World War poetry by British and German poets, including Wilfred Owen, Arthur West, and John McCrae. 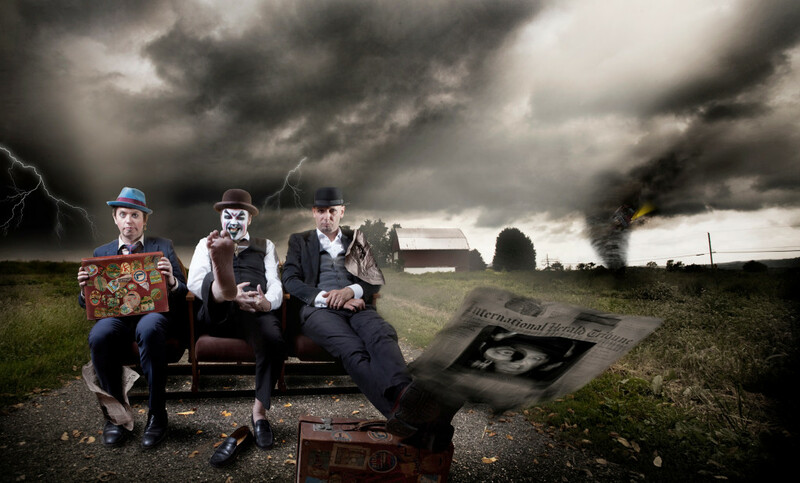 The Tiger Lillies are a cult British trio. 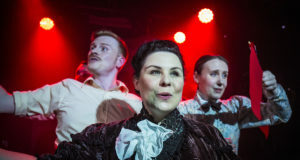 Formed in 1989, they have been described as the forefathers of ‘Brechtian Punk cabaret’ and ‘avant garde’, although they seemed to me firmly rooted in the tradition of vaudeville or music hall theatre. They have been involved in many interesting projects including one with Opera North: Lulu: The murder Ballad. The band’s musical influences include Brecht, Kurt Weill, gypsy and circus music. The instruments they play range from piano and contra bass to accordion, drums, and musical saw. Their physical appearance is that of Victorian villains and, with their completely white faces and blacked eyes, they had the look of the Pierrot troupe in Oh! What A Lovely War. At the beginning of the concert, I felt uncomfortable about the translation of the poetry into song. Not all of the words were audible over the band playing. However, thanks to the beautiful and melancholy music, and the interesting often high-pitched voice of Martyn Jacques, I soon began to enjoy the performance. One of the effective and haunting techniques the performers used was to take a sentence and repeat it several times. At one point they repeatedly chanted the title of the poem Dead Man’s Dump, by the English poet Isaac Rosenberg. This poem describes a carriage going across no mans land to lay barbed wire, while running over the dead and dying: ‘Our wheels grazed his dead face.’ The songs were filled with lines such as these, full of heartfelt suffering and immensely moving. The Grand Hall Battersea’s music-hall feel made it a great venue for this concert. Unfortunately the great organ pipes, which are quite a feature of the hall, interfered with the First World War images that were being projected as a backdrop. Most of the images were unreadable, including interesting facts like the number of war dead in different countries. The lighting, however, was used to great dramatic effect, with the stage being lit from the back to create an eerie and ghostly feel. The audience loved the concert and were on their feet as soon as the last chords were played. One of the highlights of the evening was the encore: a great rendition of It’s a Long Way to Tipperary. Booking Until: This run has now finished.